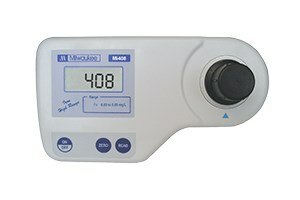 Milwaukee Mi408 Iron High Range Photometer, 192mm Length x 104mm Width x 52mm Height, 0.00 - 3.00 mg/L, 0.01 mg/L Resolution, LCD Display gives exact and accurate readings at all times. Iron high range photometer, range: 0.00 to 5.00 mg/L of FE, accuracy: ± 0.03 mg/L at 1.50 mg/L. Supplied in hard carrying case including 2 cuvets, reagents, wiping tissue and instruction manual.